Why did the GOP flip flop on Common Core? For the first time in recent memory, K-12 education is emerging as a top tier issue in the coming presidential race, at least among Republicans. That, for people who care deeply about schools, is the good news. The bad news is that the political conversation is almost entirely focused on the ever-more contentious topic of Common Core, and the rhetoric is so long on blanket ideology and short on specific policy that it often feels like politicians aren’t talking about what kids are learning, or not learning, at all. The state-led initiative to create rigorous, grade-by-grade standards is the biggest thing to hit American schools in years, but as Common Core has spread across the country, resistance has too. Sure, some is fueled by the problems inherent in such a major rollout, some by union concerns or instinctive suspicions over unfamiliar teaching methods. The complaint that’s found a receptive audience among right wing politicians, though, is that Common Core is just one more example of big government intrusion, right up there with health care reform, contraceptive coverage mandates, tough new environmental standards and more. The upshot is that in this GOP presidential preseason, Common Core has become a wedge issue, a vehicle for populist resentment toward Washington and the president, and a convenient stand-in for all that divides the party’s purist base from its less rigid, more corporate wing. As for the program’s educational merits? Well, they almost seem beside the point. To understand how we got to this strange place, consider the journey of one likely White House aspirant. For Louisiana Gov. Bobby Jindal, the first identifiable fork in the road appeared last August as he addressed the RedState Gathering, a meeting of conservative activists with tea party leanings, in New Orleans. What, one participant pointedly asked, was Jindal’s take on Common Core? It wasn’t much, but it was the first step in what would become a slow motion but ultimately spectacular reversal. And after he failed to convince the Louisiana Legislature to follow his lead, Jindal went unilateral, announcing in mid-June that “we want out of Common Core,” and ordering his staff to invalidate the contract being used to pay the multi -state testing consortium called PARCC. The move set off chaos in schools, which suddenly didn’t know which tests they’d be using in the new year, and open warfare with Jindal’s longtime allies in reform, including the state’s top business leaders, a media-savvy education superintendent and a state education board that’s now mulling a lawsuit — all of whom accuse him of playing politics at students’ expense. Can kids tell whether they’re being taught Common Core? Despite the ostentatious flip-flop, Jindal’s underlying agenda hasn’t changed; he’s still fixated on positioning himself for national GOP prominence, just as he’s always been. 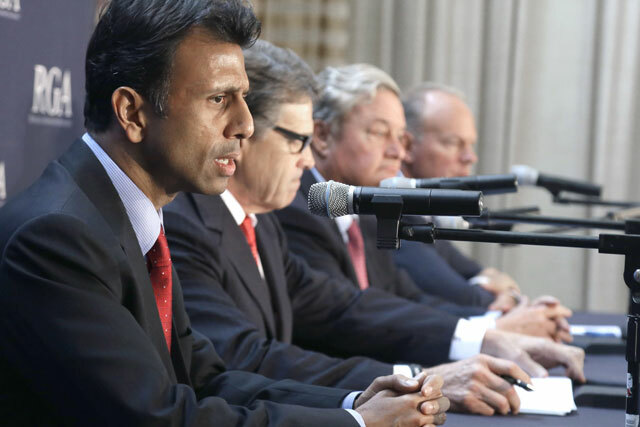 The landscape, though, has shifted dramatically, and potential candidates eyeing the party’s 2016 presidential nomination — from Jindal to U.S. Sens. Ted Cruz to Marco Rubio — are recalibrating accordingly. It wasn’t so long ago that Common Core was relatively uncontroversial, and under-radar. In 2009 the National Governors Association, under the leadership of Georgia Republican Sonny Perdue, Delaware Democrat Jack Markell and the Council of Chief State School Officers, set out to create guidelines outlining which skills students at each grade level should master. The U.S. Chamber of Commerce, the National Urban League, the Bill & Melinda Gates Foundation and others backed them up, and nearly every state signed on. President Barack Obama jumped on board too; the administration didn’t mandate anything, but it used the bully pulpit and offered financial incentives to jurisdictions that adopted rigorous standards. But it didn’t take long for the conversation to shift from workforce development and best teaching practices to the far more loaded topic of who controls what happens in local schools. Obama’s backing became a red flag to conservatives who perceived so many parallels to the hated Affordable Care Act that they dubbed it “ObamaCore,” or, alternatively, “Commie Core.” Many of the early supporters among GOP governors, Perdue included, left office, and their replacements proved far more skeptical, or at least more attuned to the party’s vocal tea party wing that, in many cases, had propelled them to office. These days, Jindal’s peers aren’t people like Indiana’s Mitch Daniels, another original Common Core advocate, but his successor Mike Pence, who has signed legislation pulling his state out. Other GOP governors with larger aspirations are fleeing too, including South Carolina’s Nikki Haley, who also signed anti-Common Core legislation, and Wisconsin’s Scott Walker, who’s distanced himself but has not made a clean break. There are outliers, though, and their names say a lot about the politics of the pro and anti-Common Core movements. There’s New Jersey Gov. Chris Christie, who has attributed opposition to a kneejerk rejection of anything Obama supports. And there’s Jeb Bush, whose tenure as Florida governor predated Common Core but who has long been a missionary for the cause — and who’s showing no signs of wavering in the face of the uprising. Unlike most of their potential primary rivals, Christie and Bush hail from the branch of the GOP that may not particularly like the federal government but doesn’t see it as a bogeyman, and that doesn’t necessarily equate compromise with surrender. They also happen to come from states that Obama won twice, so they understand that not everyone demands or even cares for small government orthodoxy. A recent poll by NBC and the Wall Street Journal suggests Common Core isn’t so toxic in the electorate at large; it found that 53 percent of “Tea Party Republicans” oppose it, that the country at large is 59 percent in favor. That suggests a pro-Common Core candidate could do just fine come 2016 — or at least swing the debate back to more substantive questions over how the new standards are playing out in classrooms across the country, and what American education policy should be. Provided that candidate can make it through the GOP primary gauntlet first. Stephanie Grace is a columnist with the New Orleans Advocate.